Over the past decade, an audacious program called Football Dreams has held tryouts for millions of 13-year-old boys across Africa looking for soccer's next superstars. Led by the Spanish scout who helped launch Lionel Messi's career at Barcelona and funded by the desert kingdom of Qatar, the program has chosen a handful of boys each year to train to become professionals--a process over a thousand times more selective than getting into Harvard. In The Away Game, reporter Sebastian Abbot follows a small group of the boys as they are discovered on dirt fields across Africa, join the glittering academy in Doha where they train, and compete for the chance to gain fame and fortune at Europe's top clubs. We meet Diawandou, a skilled Senegalese defender whose composure makes him a natural leader on the field; Hamza, a midfielder from Ghana with great talent but a mercurial personality to match; Ibrahima, a towering striker who scores goals by the bucketload; Serigne Mbaye, who glides by players effortlessly but happens to be deaf; and Bernard, often the smallest kid on the field but a sublime playmaker who invites constant comparison to Messi. 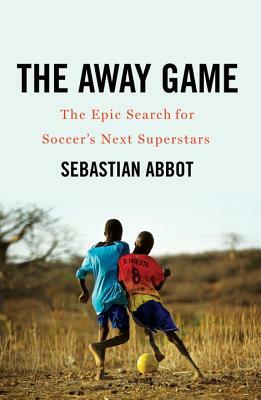 Abbot masterfully weaves together the dramatic story of the boys' journey with an exploration of the art and science of trying to spot talent at such a young age. As in so many other sports, data analytics in soccer have expanded in the wake of Moneyball, with scouts employing more sophisticated metrics like "expected goals" and tracking data to judge players. But, as The Away Game chronicles, soccer genius depends more on intangible qualities like "game intelligence" than on easily quantifiable ones. Richly reported and deeply moving, The Away Game is set against the geopolitical backdrop of Qatar's rise from an impoverished patch of desert to an immensely rich nation determined to buy a place on the international stage. It is an unforgettable story of the joy and pain these talented African boys experience as they chase their dreams in a dizzying world of rich Arab sheikhs, money-hungry agents, and soccer-mad European fans.